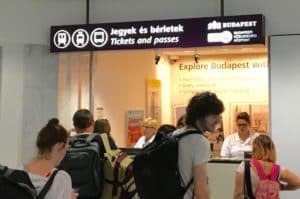 How to get from Budapest Airport to the city center? 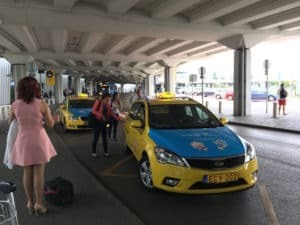 Several options are possible from the Budapest airport: taxi, public transport and airport shuttle (Uber no longer exists in Hungary) for your airport transfer. Here they are presented with details! Pick-up cost: 700 forint (≈ 2,2 € ≈ 1,94 £ ≈ 2,48$). Then a cost of 300 Ft per km ≈ 0.91 € ≈ 0,8 £ ≈ 1,03$. (cost of 75 Ft/mn if vehicle stops ≈0.23 € ≈ 0,2 £ ≈ 0,26$). No extra cost for luggage or the number of passengers. The airport is 24 km from Budapest city center, it will cost you about 25-30 € (≈ 22-26,5 £ ≈28,-34$) to reach it (excluding a traffic jam). 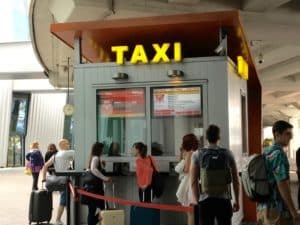 Pay taxis in cash, forints or euros (but we do not recommend euros because taxi companies offer a very unfavorable conversion rate). The vast majority of Budapest taxis also accept credit cards (Visa, Mastercard) but check with the driver before entering. Pay with your credit card in forints and not euros (due to the unfavorable rate of taxi companies). For your information: the company Uber no longer exists in Hungary and there is no equivalent service here. 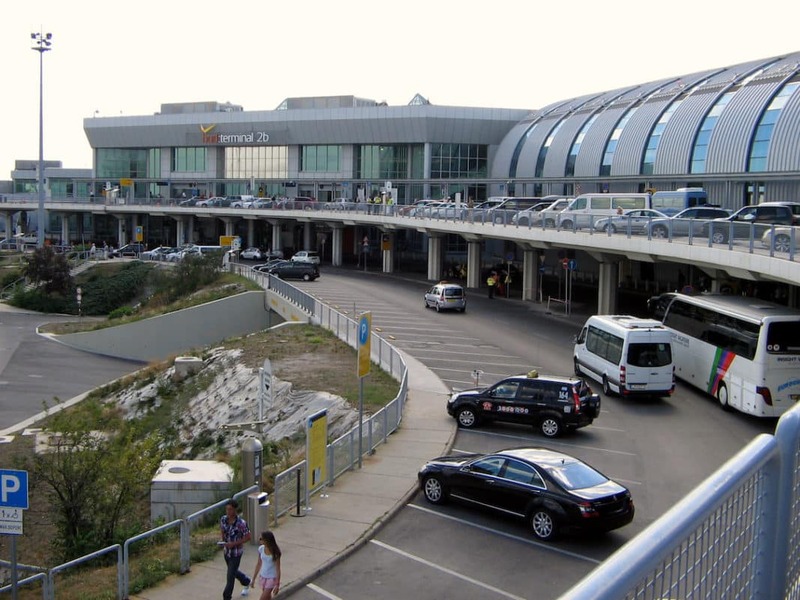 Two bus lines depart from Budapest Airport, and the station is located just beyond the exits, on the sidewalk between terminals 2A and 2B at the arrivals level. 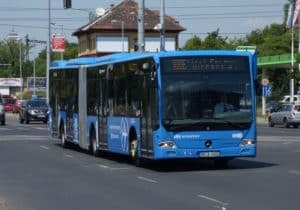 Public transport is free for citizens of the European Union and Switzerland over the age of 65 (an identity document may nevertheless be requested during a possible check) and for children less than 6 years old. No prior procedure is necessary for this benefit. Bus 100E Transfer airport – city center. 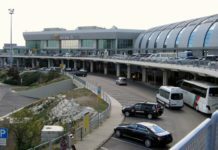 Since July of 2017, a new direct line, 100E, connects Budapest Airport with the city center. This cheapest means of transport among all available has a crossing frequency of 20 minutes. The first bus 100E leaves the airport each morning at 05:00 and the last at 00:30. You can take it at the beginning of each hour or mid-hour but allow time for the purchase of the ticket (details later). The ticket price for the 100E is 900 Ft ≈ 2.8 € ≈ 2,5 £ ≈ 3,2$. – Kálvin tér station (IXth district in Pest). – map link. – the Astoria station (VIIIth arrondissement in Pest). – map link. – and Deák tér station, terminus (5th district in Pest). – map link. In the direction of the city center – Budapest airport, bus 100E departs from Deák tér every morning at 03:40 with the last at 23:30. Bus 100E stops only at Kálvin Tér station except for the first two morning buses which also stop at Astoria Station. You can purchase a Bus 100E specific ticket at the BKK (Budapest Public Transport) counter in each airport terminal. This bus ticket 100E is not included in subscriptions (type pass 3 or 7 days) offered by public transport in Budapest or by the Budapest Card. 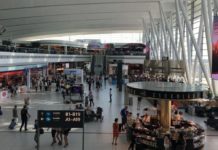 It is also possible to buy it outside at the bus station’s distributor located on the sidewalk between terminals 2A and 2B at the arrivals level. Ticket office Public Transport at Budapest airport. Be careful, however, because of the popularity of the 100E bus during a holiday period, to expect a long line. Plus, the bus is often ‘full’. A good half of the passengers will be standing for the duration of the trip if everyone is able to board the bus (frequency of 20 / 30 minutes for bus departure). Bus 200E connects Budapest Airport with Kőbánya-Kispest Metro Station, the terminus of the M3 underground line. This 200E line runs daily from 04:00 to 23:00. You can buy a Bus 200E ticket at the BKK (Budapest Public Transport) ticket counter in each terminal or at the bus station vending machine. The use of Bus 200E is included in the transport passes sold by the BKK. It is located outside on the sidewalk between terminals 2A and 2B at the arrivals level. From Kőbánya-Kispest Metro Station, passengers can take the M3 subway line Újpest to the city center. It is possible to reach the M1 and M2 metro lines at Deák Ferenc tér station in the city center. The price of a single bus or metro ticket is 350 Ft ≈ 1,2 € ≈ 1,1 £ ≈ 1,35 $. The unit price is 300 Ft each (≈ 0,94 € ≈ 0,83 £ ≈ 1,06 $) if you buy a book of 10 tickets. You can buy your tickets at the BKK (Budapest Public Transport) counter located in each terminal of the airport. It is also possible to buy them at the vending machine located on the sidewalk between terminals 2A and 2B at the arrivals level ( there may be a long line at the distributor). The Metro Line Plan is available in our ‘Public Transport section of Budapest‘. You can also use the Budapest public transport route planning tool available on this link. 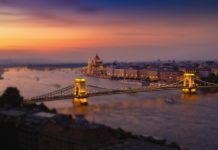 In English, it will ask for your place of departure and arrival in Budapest, and you will see the different options by metro, bus and tram to reach your destination. Minibud company offers a shuttle service. 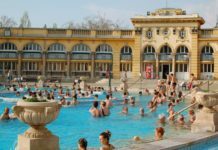 The principle is to put different passengers / groups together (about ten passengers maximum) at different addresses in Budapest. Passengers whose address is closest to the airport are thus given access first. 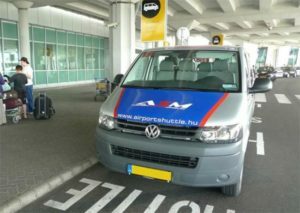 Also note that the shuttle will wait to reach a certain number of passengers before leaving the Budapest Airport. MiniBud counters are present in each terminal (2A and 2B), just after the customs exit. Additional information available on the company website. For other services at Budapest Airport (shops, currency exchange, smoking areas, catering, etc. 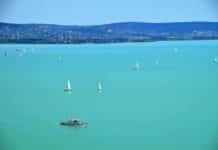 ), do not hesitate to consult our article, ‘Practical information’ about Budapest Airport on this link. 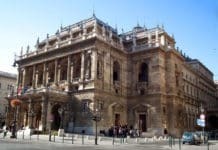 Are you coming to Budapest soon? 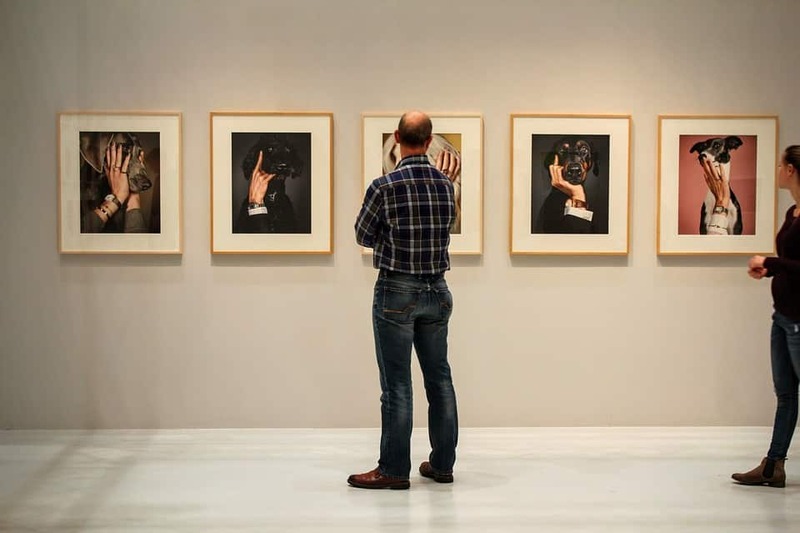 Do not hesitate to consult the calendar of events for Budapest (festivals, exhibitions, concerts, etc.) 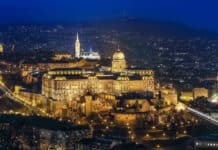 on this link and our recommended itineraries for a visit to Budapest in 2 days, 3 days and 4 days!